AWESOME!! Naturally, I was able to save this much money because I cut every single coupon that comes out on Sunday – AND I use last week’s Extra Reward Bucks. Combining those two forces with this week’s circular sales – I really did AMAZING today. Ok let’s break it down. I love extreme couponing! Always Pads – B1 Get $1 ERB (Plus $2 off coupon) — note this wasn’t in the circular. I was surprised to find the $1 ERB available for me?? I used $12 in ERB from last week AND a coupon that was emailed to me this week for $5 off of $30. Which left me to pay a whopping eight cents! 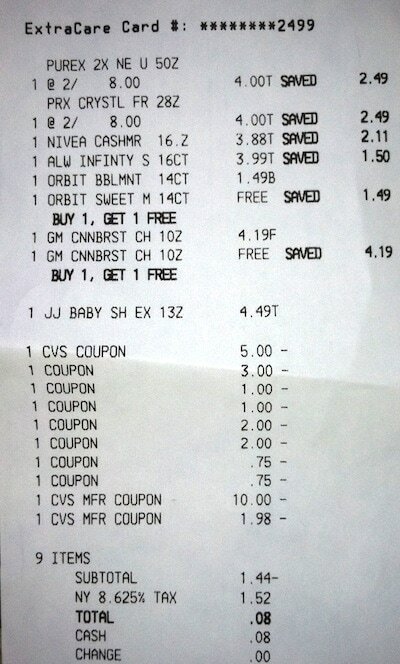 Here’s something I want to point out – I was able to use a coupon on an item that was marked FREE at CVS. So, the cereal was Buy 1 Get 1 Free but I gave them 2 $.75 off coupons and they took it. You can put a coupon on a free item!! I NEVER KNEW THIS BEFORE. Previous Post: « Have You Tried Restaurant.com Yet? That is absolutely amazing! I have never done that well. I was mad at myself today because I wasn’t well enough to leave the house, and I had TONS of great coupons that expired today. Bummer. I’m interested: do any of your husbands do the coupon thing? Mine loves the savings, but wow does he get impatient and moody if I hand him any to use. (He doesn’t do the legwork, clipping, etc – I just ask him, on a very rare occasion, to redeem some if I know he’s stopping by the store). I couldn’t believe how stressed/irked it made him yesterday. I thought WOW, he really doesn’t get how much work I’ve done over the years. He’s been spoiled. He did use some, however, and saved $13. I used the nivea coupon at walmart yesterday, it was in sale for $3, so I got it free! I’m too sensitive…because I really really REALLY got attached to the way we all used to interact w/each other on your old site, Vera. It seems a lot of the “old-timers” flew the coop! I’ve been w/ya since you first started INO…I think Natalie was just a wee baby. Anyway, this is not a criticism of you or the cool folks that now frequent your site – it’s just an “adios”, I suppose. It’s almost impossible to get people to chat w/you now or answer your questions. I AM over-sensitive because I miss the old days, and the new format makes me feel invisible most of the time or even disliked. And when someone does answer me, I feel so grateful that it’s pathetic, LOL! That is indicative that this isn’t healthy for me any longer. I miss the old camaraderie and I’m too attached to something that now makes me feel bad. Anyway, it was a good run overall. 🙂 Take care!! So sorry you feel this way. I can’t control who responds to blog comments. I wish you were happier. hi , i am new to this blog , i need to know which are the best Sunday newspaper to collect maximum coupons. what are few best websites to look for maximum savings ……..I want to start suing coupons and save money as i lost my job and cannot afford to buy expensive stuff. 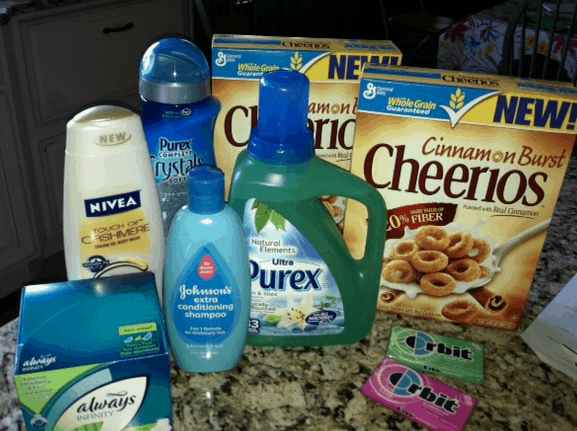 I would be glad if you can show me some steps in order to save and do extreme couponing.